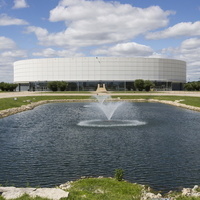 NIU's Convocation Center houses a variety of entertainment and athletics events. The multipurpose facility can seat up to 10,000. Professional concerts, job fairs, trade shows, commencement ceremonies, academic gatherings and more take place here. The "Convo" also is home court for NIU athletics offices, Men’s Basketball, Women’s Basketball, Gymnastics,Volleyball and Wrestling. The organization and set up was great this year. From beginning to end there was help from staff and faculty. Having career counselors walking around the name tag/prep tables was a nice touch. I do wish the school could attract some different companies. Many seemed to be cold-calling sales companies which doesn't necessarily require a degree. So nice to see so many future employers at NIU Job Fairs! Great event! Had not attended the Spring Internship & Job Fair in the past and I was very impressed with the number of employers in attendance and the great organization. Kudos to the organizers! To see my grandson, Eric Morgensen get his degree in engineering was great. His grandfather, my husband, was able to see it live stream as he is housebound and couldn't attend.